With near full employment in North America the costs of labor in a distribution center is quickly approaching $18 per hour, nearly double from the 2010 rate. At lower wages, it was more difficult to cost-justify the automation expense. Management could throw more labor at the volume issue. Now with much higher labor rates (not including health insurance, workers' compensation, vacation time, and safety concerns), conveyor automation is axiomatic and needed more than ever before. Based on rapid changes driven by e-commerce and omnichannel purchasing the supply chain has evolved quickly over the past several years with many companies becoming distributors rather than strictly manufacturers. This shift demands a streamlined approach to receiving, putaway, and order fulfillment. Any warehouse or distribution center shipping more than a few thousand orders per day must examine the efficacy of automation. This migration from a manual order fulfillment and shipping process to automated solutions, increases efficiency, decreases demand for labor, improves order accuracy, and ensures customer satisfaction. Conveyors are a core component of all material handling or automation systems. Conveyors are used to transport, accumulate, and sort packages, boxes, or products. From receiving to order picking and fulfillment; from transportation of product to packing or shipping areas, conveyors are the freeway leading to final shipping sorting and accumulation. 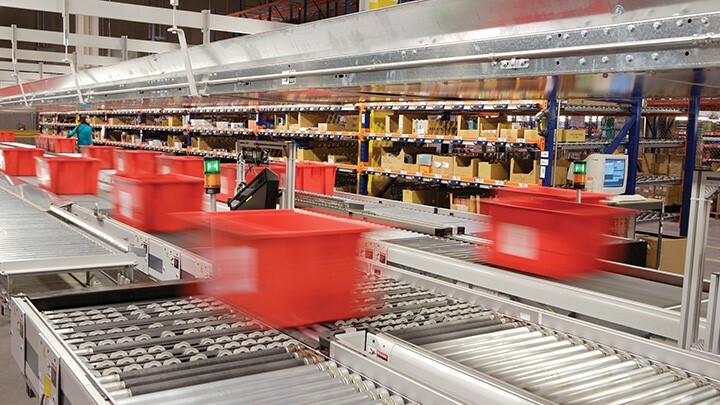 Combined with the B-to-C (business to consumer) e-commerce model where the volume of packages extends beyond FMCG (fast-moving consumer goods) and customer expectation for next day delivery, automated conveyor systems are essential in any distribution center. Often entirely mechanized and automated for high-volume traffic, conveyors can move cases and boxes, plastic totes, pallets, poly-bagged items, beverage cartons, mixed SKU pallets, and individually packaged merchandise. The landscape for automated conveyor systems is changing as distribution changes. Distribution centers are handling more individual items than ever these days. Grocery store chains and big box retailers are receiving mixed-SKU pallets that are designed for specific aisles in a store. Retailers that once received full pallets of product once a week or month are now receiving a few cartons every day. Production lines, goods-to-person automation, picking and packing stations, and direct-to-consumer fulfillment are just some of the applications used for automated conveyor systems. Rather than off-the-shelf automated conveyor solutions, an engineer-to-order approach allows customers to select conveyors based on products to be conveyed, ease of maintenance, reliability, uptime, price, speed, and design flexibility. Some of the design elements in distribution centers also include conveyor systems selection based on low energy/power consumption, low noise emission, roller technologies, and individually powered zones. With the average new distribution center exceeding 500,000 square feet, automated conveyor systems must cover large distances or if adopting a cellular production model, capable of fitting in tight spaces. A best practice lean manufacturing approach to designing and choosing automated conveyor systems, requires expertise and experience, not merely ordering a conveyor SKU on-line. Even smaller conventional warehouse operations have applied limited automation and are quickly shifting away from manual processes and manual labor to get product in and out of the distribution center and in the hands of the customer. Ultimately the impending urgency of higher labor rates means the capital expense of conveyor automation can demonstrate a rapid return on investment (ROI). John Murdoch is CEO of Alfacon Solutions Ltd., based in Canada. Murdoch is a thought-leader in both the manufacturing and materials handling sectors. Leveraging more than a quarter century of experience, Murdoch brings a unique perspective to engineered material handling solutions and the role of automation. Murdoch can be reached at john.murdoch@AlfaconSolutions.com.